According to reports, McGuinness will work with Celtic for three days a week while continuing as Donegal boss. McGuinness oversaw Donegal's All-Ireland win earlier this year. 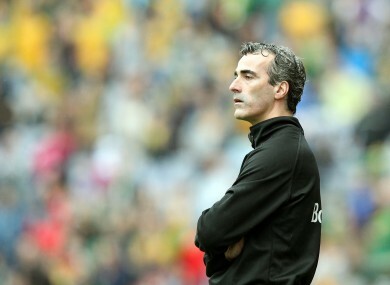 CURRENT DONEGAL COACH Jim McGuinness looks set to take up a part-time role as performance coach of Celtic’s youth department, according to reports. Speculation surrounding McGuinness’ future intensified, when he was spotted in attendance at the Scottish club’s game with Barcelona on Wednesday, while GAA journalist Ewan MacKenna suggested on Newstalk’s Off the Ball that the move was “inevitable”. MacKenna said that having made “a number of calls” yesterday, it appears as if he will be appointed to help enhance Celtic’s youth set-up. “It seems to be that McGuinness thinks he can do it on a part-time basis,” MacKenna added, explaining that the esteemed coach is eager to remain in charge of the Donegal team, while simultaneously undertaking his new, prospective role. Similarly, The Irish Daily Star have indicated that the move looks likely to happen, reporting that McGuinness met with Celtic officials yesterday. Such a decision would come as little surprise, with McGuinness having been regularly linked with a move to soccer following Donegal’s All-Ireland triumph earlier this year. The move would still likely to cause consternation among Donegal GAA officials however, with the side ideally seeking to retain McGuinness as manager on a permanent basis. Email “Donegal's McGuinness set to take up part-time Celtic role - reports”. Feedback on “Donegal's McGuinness set to take up part-time Celtic role - reports”.